Artsreach works through a network of dedicated volunteer promoters, without whom our events simply wouldn't happen. We currently have around 50 venues on the Artsreach circuit, which are mainly village halls in rural areas where there is no existing arts venue, such as art centres or theatres. Artsreach works with over 100 promoters across rural Dorset to promote live professional arts events in their local venues. Each year we produce a ‘menu’ of work available for booking through Artsreach from over 40 companies. 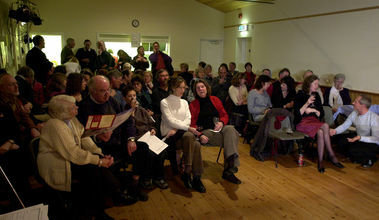 The menu includes theatre, dance, music, storytelling and family shows, and promoters can select up to six productions that they are interested in hosting. We then work with companies and promoters to confirm a schedule of dates, with each promoting village hosting two to four events across the three seasonal Artsreach performance programmes. "We always enjoy the Artsreach events. As a village community they are very important in bringing folk together. Please keep it going!" Artsreach underwrites the cost of the performances and, thanks to the funding it receives from Arts Council England, Dorset County Council and North, West, East and Purbeck District Councils, can subsidise the ticket prices to make events as accessible as possible. The actual cost of a show paid by Artsreach can range from £300 - £1,500. Host villages are required to return a minimum amount of £200-£400 to Artsreach depending on the show, or 80% of the total box office, whichever is greater. Promoters are also encouraged to increase the income for their venue and improve the overall experience for audiences by running a bar or offering refreshments. "Artsreach is essential for the cultural life of the rural parts of Dorset - it really should and must continue"
Fundementally, Artsreach events serve to make the arts accessible to those living in rural areas of Dorset, and to add to a sense of community by bringing people together in their local venue to experience a quality performance. Aside from its live performance programme, Artsreach also runs a vibrant programme of children's workshop activities throughout the summer, and regularly offers participatory workshop opportunities with visiting companies. If your village is not currently hosting Artsreach productions and you are interested in becoming an Artsreach promoter, please let us know. At the moment there is great demand to join the circuit and you may need to join a waiting list. Contact the Artsreach office on 01305 269512 or email info@artsreach.co.uk for further details.